The Tom Ferry Podcast Experience is a collection of episodic audio content that is focused on helping you create a life and business that you love and deserve, by design. You’re here because you truly believe that it’s possible to achieve a well-designed and fulfilling lifestyle instead of settling for a life with a default day-to-day autopilot routine that ultimately makes you unsatisfied. So our goal is to introduce you to the people and ideas that will empower you towards the next level of success. 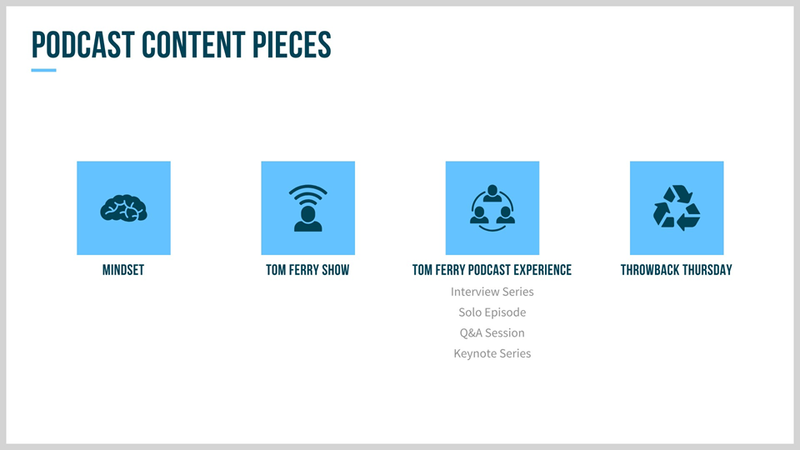 In order to produce a remarkable Tom Ferry Podcast Experience, I took elements from a variety of top successful podcasts (Tony Robbins, Tim Ferris, Lewis Howes, Perpetual Traffic, NPR, etc.) and fused them with our current content themes and message. I tried to emulate the relaxing “radio” sound and feel of the Tony Robbins, NPR, and Perpetual Traffic podcasts as opposed to the less formal and unfiltered tone of podcasts like the Joe Rogan Experience. Every series of podcast content (except Throwback Thursday) will have video counterparts. Mindset is a weekly motivational short from Tom that kicks off the week. The video counterpart of this piece can be utilized for social organic and paid ads(for Mat to utilize with building Facebook audiences). The audio piece can also be repurposed for Amazon Alexa briefings. No ads. No intros/outros. Just the content. It’s meant to be used as audio that can be played on repeat or a playlist. A slightly tweaked version of the show in podcast format with ads. The main podcast episode will be a rotation between an Interview Series, a Solo Episode, a Q&A Session, and a Keynote Series (just like the Tony Robbins Podcast). The Keynote Series will be the only content featuring a co-host and repurposed content, in case we are not able to record an episode with Tom. This piece consists of repurposed content mainly from the VLOG, useful snippets from previous episodes, or live sessions.